Last known photo of 'Cousin' Warren Duffy from early in 2018. It is with a very heavy heart that news has arrived of the passing of WPGC's, 'Cousin' Warren Duffy on 06/13/18 at age 80. Warren was originally from Baltimore. He got his start working in college radio. At 17 he got a part time gig at WFBR in Charm City. A summer job took him to WASA in Havre de Grace before moving on to WFMD in Frederick. In a move that would prove to be prophetic, he was then hired by the new GM at WAQE in Baltimore, Bob Howard. Leaving in 1959 to Program a station for Susquehanna in York, PA, he next landed in 1961 at WHLO in Akron, OH, again as PD / afternoon man. That station came to the attention of none other than Bob Howard, by then GM of WPGC whose family lived in Ohio. Howard would listen to Duffy on visits to his hometown and by 1966 offered the PD and PM Drive position to Warren. During his tenure at WPGC from 1966-1968, Duffy accelerated the transformation of the station from a colloquial suburban Maryland entity to a full fledged Washington powerhouse. His high energy on-air approach was matched by a dizzying array of seemingly never-ending innovative contests and station promotions, including numerous personal appearances at teen dances too many to count on both the MD and VA side of the Beltway. Following the assassination of Robert Kennedy with whom he had developed a friendship from working with Ethel on Special Olympics, Warren temporarily walked away from radio, spending the next few months coming to terms with the loss in the Virgin Islands. By the Fall of 1968 however, WPGC owner, Max Richmond hired him to be (wait for it.....), PD and afternoon guy at WPGC's sister station, WMEX in Boston. A year later, he made an abrupt change in location (and format), becoming the first PD of KMET in LA and launched its legendary underground format. Further changes were in the offing. A brief later on-air stay at KDAY in LA in 1974 marked the end of his on-air career (at least with music formats). Duffy had long personally known the Beach Boys since his days of playing their records in the '60's. Putting his promotional chops to work, he became head of Promotion & Publicity for the band during their '15 Big Ones' tour in 1976. In the early '80's. 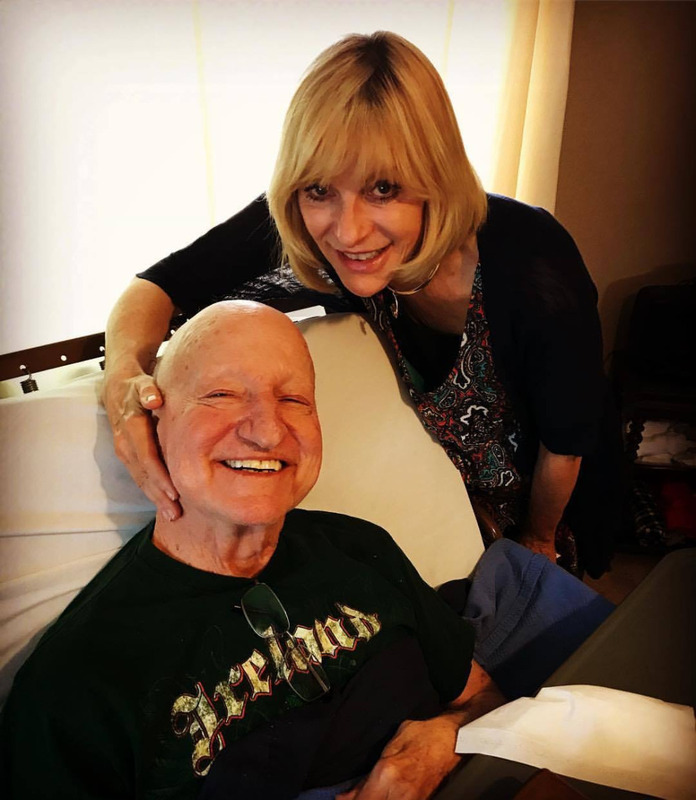 Duffy made the biggest change of all in his life up to that point, becoming a Born Again Christian after meeting the Reverend Robert Schuller in Orange County, CA. It was Schuller who convinced him to return to the airwaves, this time as a Talk show host, focusing on matters beyond the entertainment industry he had been a part of for so long. For a decade from 1994-2004, Warren hosted the afternoon show for Salem at KKLA in Los Angeles. Upon his retirement, he enjoyed life in Huntington Beach, CA (the actual 'Surf City' of Jan & Dean fame) before relocating to the Arizona desert where he lived out the remainder of his life. In recent years, Warren was diagnosed with Stage 4 cancer but made a remarkable recovery, affording him several more years. In September of 2017 however, he was admitted to a hospital in AZ for pneumonia. Soon afterwards the cancer returned. His final days were spent in an assisted living care facility there. Our good Cousin's mark on the evolution of WPGC during its hallmark years in the mid to late '60's cannot be overstated. Under his guidance, WPGC successfully fended off direct format competitors such as WEAM as well as other formidable market opponents such as WOL. Much as been made of WPGC-FM's dominance a decade after Duffy in the '70's. But without the groundwork he masterminded for WPGC-AM in the '60's, there would have been no legend to move over to the FM band. 'Cousin' Warren Duffy was among the best of the 'Good Guys' and a true friend of the WPGC Tribute Site. A memorial service in his memory will be held in the near future at Refuge, Calvary Chapel, Huntington Beach. In 1959, we put a "Good Guys" Top 40 format together at a little station in York, PA owned by Susquehanna Broadcasting. For its time, it was very innovative. The company purchased a station in Ohio (Akron to be exact) and in 1961 they named me as their first program director at WHLO and of course, the "Good Guys" format trailed along with us. By 1966, the station came to the attention of Bob Howard, the GM of WPGC, whose family lived in Cleveland. He would monitor the station when he visited his relatives, and somewhere about 1966 he and I got in touch and next thing you know, I was living in Silver Spring, MD and I was the afternoon jock and the PD of WPGC. I left WPGC to take a hiatus, moving briefly to St. Thomas in the Virgin Islands for a time of rest and re-focusing because - frankly, 45s were dying out and LPs were coming in and that meant a new format which I called "underground" and took that format to Boston and WMEX - also owned by the company that owned WPGC. Then, I brought the "underground" format to Los Angeles and in 1969, put it on the air at KMET FM. I returned to the air briefly in 1974 - with Wolfman Jack - on KDAY here in Los Angeles - a blend of albums and 45s that was semi-successful until the station was sold to black ownership and all the white guys were fired - including me. Washington was one of my best cities in radio, until I came to Los Angeles. I was there for about 3 years - using the name "Cousin Duffy." Jack Alix had been one of our competitors on WEAM - so we hired him to join us. Also, from the upper Michigan peninsula - I hired a DJ and since Peyton Place was such a big hit TV show at the time, we changed the guy's name to Bob Peyton - he did our mid-days. Harv Moore was the morning man when I arrived and he was still there when I left. One of our weekend DJ's was Bob Raleigh - who we called "Tiger Bob" when he was playing records. Marv Brooks had been one of the disc jockeys when I got there, but we thought his talents were better used in the newsroom and so he became one of the station's premier news talents. Bill was a very funny guy. Always drove an old Chevvy, wore a grey suit and tie, and kept meticulous records of ALL of his clients on 3 x 5 cards that he carried with him everywhere. When you talked with Bill by phone or as he made a sales call, he would update your file card so he always knew that your wife just had the flu, your kid just made the team, or you were planning a dream vacation. When you as a customer called him, you were amazed that he knew so much about you and was interested in you as a person, not just as a client. He knew your birthday, anniversary and your kids big days too. And when he made a sales call, he always parked his old non-discript Chevy in a prominent place so his customers got the subtle impression he was a hard working family guy who sincerely appeciated you and your business. He had a very profund impact on my life. Hope he's enjoying life in FL - he deserves it. I remember coming on the air with a big promotion: for the March of Dimes, I marched from Dulles Airport to the Washington Monument - and as long as the phones kept ringing, I kept walking. I don't remember how much money we raised, but I do remember I walked in a blizzard from 6 in the morning to about 6:30 that night. We had many, many successful promotions and events connected with the station including the WPGC "Hide the Picnic" where we invited listeners to come to a free picnic - but we only gave them clues to the location. They had to find out where the big event was being held. That was lots of fun. And of course, hosting the concerts with Hendrix and Joplin - with Jim Morrison - and so many others. Brings back wonderful memories. The Beatles had already hit by the time I got to Washington. I was one of the first 3 program directors in America to feature The Beatles on WHLO in Ohio -- they had recorded a single on a small label prior to their major releases on Capitol Records, and we made one of them our PICK HIT OF THE WEEK, played it every other hour and even had Brian Epstein on the air thanking us for playing their record in America. None the less, we tool full advantage of connecting to the British invasion while I was at WPGC. I have no airchecks - no jingles - very few souvenirs from that era - just some wonderful memories of a time in radio history that perhaps can never happen again. Jack and I were young kids getting started in the radio biz back in DC. As I remember, he was at WEAM when I first heard of him. For a very long time General Manager, Bob Howard and I were very aware of Jack's presence in the marketplace and his great work and secretly we always hoped he would someday be part of our Good Guy team. Then he arrived and quite honestly we didn't know what to do with him so we gave him the evening show. But as you know, with 'PGC being a daytimer back then, I didn't even get to do my entire drivetime show during the winter (we signed off at 4:45PM for a few weeks). So it took a little convincing but Jack came onboard and he was simply wonderful to work with. argued, never disagreed, always made things work for the good of the station and that was always his first thought. He also had a terrific promo mind and was constantly bringing famous recording artists to town for live shows. We teamed up on a few of them over at the old Arlington Roller Rink - remember? He always had a smile. That's what I remember most about Jack. He was never down or depressed. He always had something to smile about. It -- and he -- were infectious. He not only smiled, he laughed out loud long before the internet. It was a combination giggle / laugh and many times he laughed so hard he broke into a cough. He was simply a joy to be around. He went on a vacation to Mexico one year and brought me a beautiful silver gift back from his trip. In all of my years in broadcasting, nobody before and nobody since has ever been so thoughtful. He was a real pioneer. He was a good friend back in the '60's. I send my condolences to his family and my thanks to God for knowing - and have the chance to work with - such a great, great man. I remember Cousin Duffy's '68 Cadillac - he had a brand new gold convertible painted with a psychedelic scheme that most thought bizarre. I was thirteen and I kinda liked it. In those days, it was probably pretty cool among the hip crowd, but most thought he had ruined the car and destroyed its resale value. 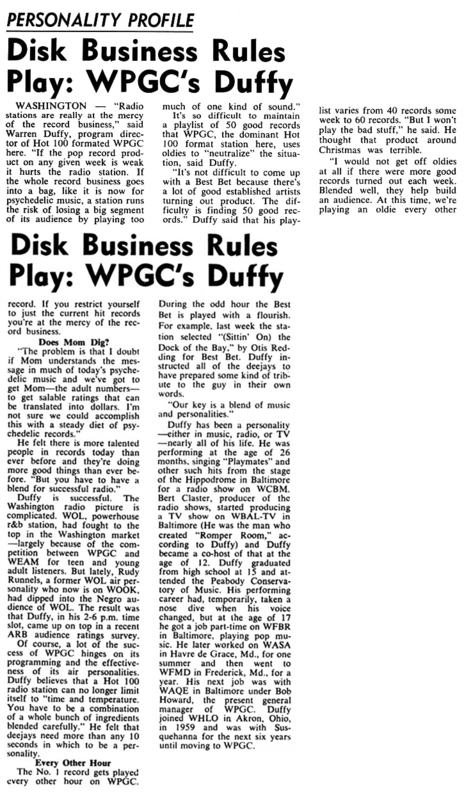 I was Sales Manager at WPGC in '66 when Duffy arrived. Bob Howard said, “I just hired a new PD and PM jock. He has a ‘mop’ haircut like the Beatles. You think that will go over OK?” Of course it did. I took Duffy around to the DC ad agencies to promote the station. He did a terrific job. Highly intelligent man. One of the smartest humans I have ever known. Did massive show prep in the days when nobody did it: typed tons of material onto “cue cards” specific to each show. Said he never messed up a break that way. On air, flawless -- left nothing to chance. Always the showman, he rode around in a big gold Cadillac. Highly energetic. Always on. He was exactly my age it turns out. I never knew. Let's just say the life he lead then was way different from his later one as I understand it. I have so very many fond memories of Cousin Warren Duffy. Those days of Top 40 Radio were unique and sad to say, we probably will never see their like again. I wrote the song below, "Jingle Jangle Morning" (written and performed by Bill Kaffenberger, (c) 2006 by Loving Kindness Music BMI, used by permission of the author) as an autobiographical song about my teen years during the late sixties growing up in Northern Virginia. Of course the WPGC Good Guys were a huge part of that time. I really like that line "we had old Jack Alix and Cousin Duffy 'cause the classical station was way too stuffy." It really says it all about what those two guys meant to a lot of us teens, they were a big part of our day, every day! A true good guy (pardon the pun). One of the first jocks I met as a kid. Duffy was friendly, never condescending; he made you feel special. Sorry to hear this. Sorry to hear this. Used to listen to him a lot during my junior high years. God bless. Some of my earliest memories were listening to Cousin Duffy when Igot home from school. And little did I know less than 10 years later Iwould be on the air at WPGC. Memories like that remind me if I retire myself soon (or they retire me) I know I've had a great ride! I used to listen to Warren Duffy when I was a kid in high school in Ohio. Actually met him at a DJ host dance. It looks just like the man I met. He worked on an AM station in Akron. On stage before 12,000 strong at the 'Hide the Picnic' promotion from September 1967. A number of years ago, Warren contributed many artifacts of his career for inclusion on this site. Some of these have been digitally restored. Others are awaiting restoration. In the interest of time however, the following are a series of photos, images, articles and the like of his career which have not yet been digitally enhanced but warrant posting now. 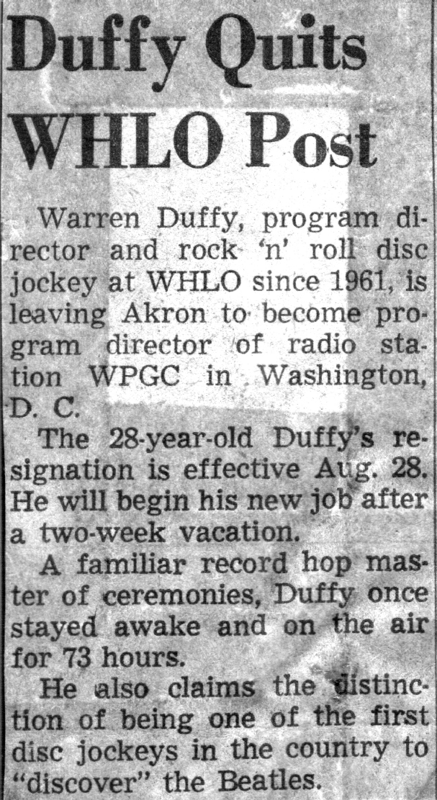 The first of these is an announcement in a local newspaper in Akron in August, 1966 of Duffy's departure for Washington and WPGC. 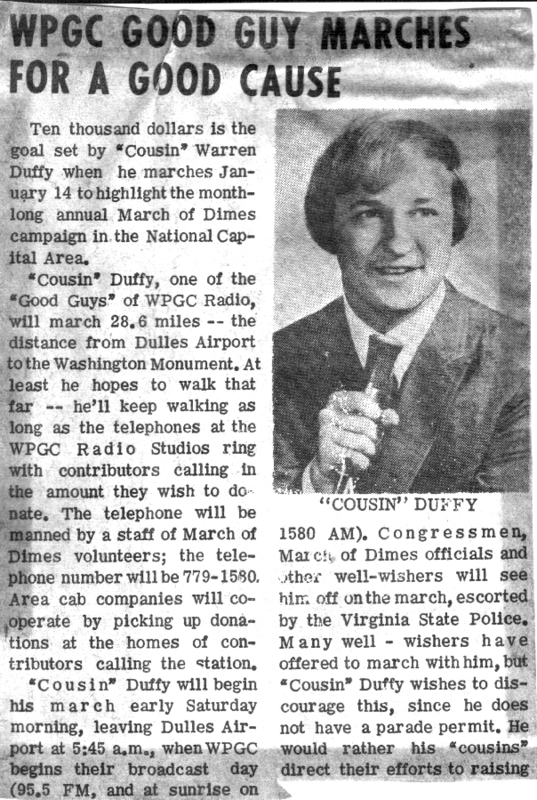 Duffy made a splash soon after his arrival in DC with the 'March for the March of Dimes' in 01/14/67. The 28.6 mile trek was notable for both the distance - from Dulles Airport to the Washington Monument, as well as the blizzard that hit Washington that day! Warren was seen as well as heard in DC on Channel 20's, 'Wing Ding!' teen dance show (the TV station was owned by Milt Grant who had once had his own long running dance show on Channel 5 every afternoon). Duffy hosted the Saturday version of the show from 03/25/67 - 05/13/67. The 'Bill Miller' mentioned in the article was WPGC's, 'Bob Raleigh', the fifth of the six to use the house name. Even by 1968, WPGC's appeal was multi-generational, catering to Teens at night and Moms in the daylight according to Duffy as evidenced by this Billboard article from February 2nd of that year. Heavy use of Gold titles to balance the library brought in the parental units while the currents of the day spoke to their kids, yielding an especially broad audience mix for a typical Top 40. 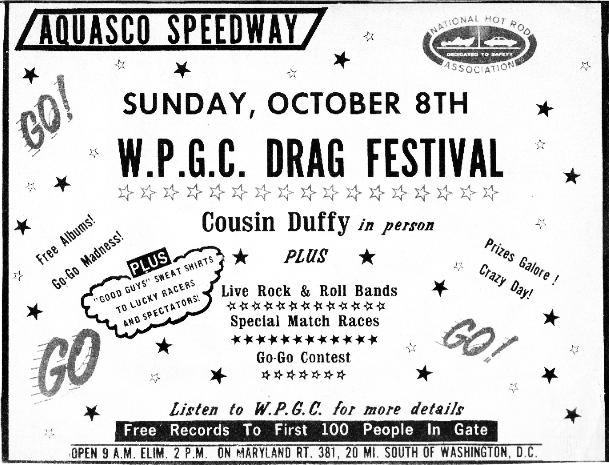 One of dozens of appearances Duffy did around DC, this one at Aquasco Speedway on 10/08/67. Presumably, the 'drag festival' was about cars!